Jonathan from MJ Yarns dyes many gorgeous colorways for us, from our shaded solid house colors in Lhasa Wilderness and Himalayan Trail to several stash-worthy limited edition yarn colors on several of our bases. He is also our official dyer for the ongoing Master Color Series, which is dyed on our luxurious 100% Mongolian Cashmere yarn, Xanadu. 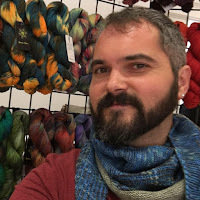 We've just released Series 2 - Winter, Begone and asked Jonathan to share some of his favorite color combinations from the palette as well as tips for choosing colors for any project you'd like to make. Macbeth is a much stronger green reminiscent of the evergreens that hold the promise of life in the dark winter months. Like every color in this palette, I added just a little bit of earthiness to this green as a reminder that spring isn’t here just yet. Absinthe is a gentle sage green with just a touch of cool earthiness. It is filled with all the vivacity of new leaves poking through the hard packed snow. Beneath Broken Earth is a solid purple and the darkest of this group. The combination of a little red and orange for heat and some cool blue and grey make this purple rich and complex. It’s the perfect anchor to this series. Maiden's Blush is a gentle red that captures the essence of the blooming crocus. It lives solidly in the warm side of the color wheel but just a bit of grey keeps it grounded. Cosmo achieves the near impossible- a subtle yet rich and interesting pink. Like all the colors in this season's palette, Cosmo has just a touch of grey adding a level of sophistication and cool. Blonde Ambition is the grey that brings this whole palette together. With just a dash of cool, it captures the essence of a freshly fallen snow with enough brightness to remind me that there is hope for warm days ahead. Each of these stunning colors will stand alone for a gorgeous garment of any type - but if you want to blend them, there is tremendous opportunity for gorgeous gradients and fabulous color work. Hue: Hue is what we typically think of as color, and this palette has four: purple, red, green and grey (technically a shade of white, but for the sake of simplicity, we’ll call it a hue in this conversation). Tone/Shade: Overall, this palette has been shaded down from its purest hues - all 6 colors have some grey added, which means they’ll play well together when we get to actually combining different hues. High value or dark color: Beneath Broken Earth; think of high value colors as good anchors. Mid-value colors: Macbeth and Maiden's Blush. Light colors: Absinthe and Cosmo. These are essentially lighter versions of the mid-value colors just mentioned. Low or no value color: Blonde Ambition. These colors can act as frames to allow other colors to pop; they can also provide a gentle field of color that can be framed with darker colors. TIP: When approaching any color palette, you can try sorting them according to value as we did in the example above to help choose which colors to mix and match! 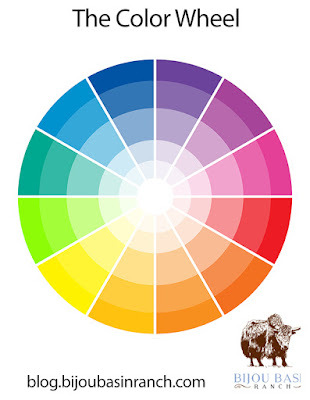 Color Relationship: When we place each of these colors on the color wheel, we see that we are dealing with complements or colors directly across from each other. Essentially, this palette boils down to red versus green with some purple standing next to the red and grey holding the whole thing together. WARM: If we take all the warmer colors (including the slightly red-purple), we end up with Beneath Broken Earth, Maiden’s Blush and Cosmo. If we add the grey Blonde Ambition to the end, this creates a gorgeous gradient or could make for some interesting striping if done with alternating values: Beneath Broken Earth (dark), Cosmo (light), Maiden’s Blush(dark), Blonde Ambition(light). COOL: We can do exactly the same thing on the cool side of the color wheel, again using Beneath Broken Earth as an anchor. The gradient palette would be: Beneath Broken Earth, Macbeth, Absinthe, Blonde Ambition. If you wish to work in alternating stripes, try: Beneath Broken Earth (dark), Absinthe (light), Macbeth (dark), Blond Ambition (light). L-R: Beneath Broken Earth, Macbeth, Absinthe & Blonde Ambition. Temperature, revisited: A piece using all of the warm colors listed above with little pops of the cool Absinthe or Macbeth would make for a stunning garment. The same is true in reverse - try using all of the cool colors listed above with pops of Maiden’s Blush or Cosmo. Norwegian colorwork mittens or an Icelandic sweater with these color combinations would be fantastic! Value: Try combining Beneath Broken Earth (dark) and Blonde Ambition (light) as your contrast colors. Imagine a Stephen West shawl made using Beneath the Earth as a frame along with one of the middle value colors and Blonde Ambition popping out of the whole thing! Bottom, L-R: Macbeth, Maiden's Blush, Absinthe & Cosmo. There’s any number of ways that the colors from the Master Color Series 2: Winter, Begone! can be combined. I can’t wait to see what you come up with! One last note: when combining radically different colored yarns, it’s always wise to be very careful in the washing and blocking process. 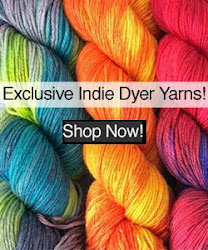 At MJ Yarns, we take extensive measures to ensure that every skein is perfect, that the dye is set and any excess dye is removed but sometimes even the best efforts leave a bit of dye behind. When you block your project, it is safest to use cold water and add a splash of fabric softener. The softener has something in it that will keep excess dye suspended in the water instead of depositing on the yarn where you don’t want it. 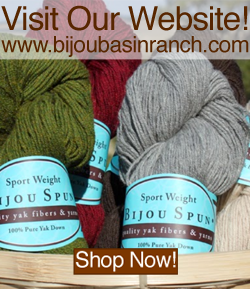 Jonathan Berner started MJ Yarns to live in a yarnie world of beauty, truth and honesty. As a manager for a major shipping company, he learned exactly what he didn't want from a job. Finally, Jonathan decided to turn his knitting obsession in to a career. His dedication to artistic merit and business acumen from the corporate world make for some of the most incredible yarn around.